Snowshoeing is an excellent sport for recreation and fitness, and it extends your hiking and running season into the winter months. All ages and ability levels can enjoy the sport, alone or as part of a group, and the learning curve is short. If you can walk, you can snowshoe, though it might not be easy. It’s an inexpensive sport requiring minimal gear. Once you purchase your snowshoes and a pair of poles, simply wear appropriate footwear and layers of clothing and you’re ready to go. Snowshoe styles are divided by manufacturers into three categories: Flat terrain snowshoes are designed for easy walking on flat ground. Rolling terrain snowshoes are the best choice for hiking rolling to steep hills off the beaten path. These are a good value unless you plan on blazing your own trail through the back-country where it’s generally steep or icy. For that type of terrain, choose mountain terrain snowshoes. Snowshoes have an important purpose: they allow you to travel over snow-covered ground without struggling or sinking in. They provide flotation by spreading body weight evenly over a large, flat surface so you can easily hike, climb, or even run. The heavier the person or the lighter and dryer the snow, the more surface area is required in a snowshoe. Wear suitable boots and moisture-wicking clothing layers. Invest in a pair of gaiters to keep snow out of your boots and shoes. As long as you choose layers you can probably dress lighter than you would for a walk in comparable temperatures since you’ll be working harder in snowshoes. Before you go, know how your gear works. Try out the snowshoes at home, testing the bindings so you’ll be able to easily tighten them when you’re on the trail in the cold. Even if you’re in great shape start out with a shorter route than your average hike and look for one with shortcut potential or a loop. You may be surprised that your pace is roughly two times slower than hiking. 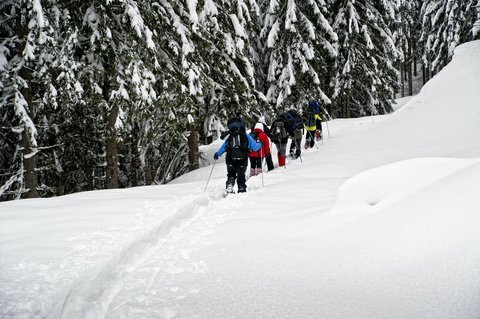 No worries as snowshoeing is done at your preferred pace, so you can go easy or go hard. It’s low-impact and helps you stay fit during the winter. There are several ways to walk with snowshoes depending on conditions. Walking on flat to rolling ground is intuitive even for beginners. Most snowshoes have simple “strap and go” bindings to fit a range of boot sizes and styles. Your stance should be wider than normal so you don’t tread on the inside of the snowshoe frame. Poles are an excellent aid for the novice and a must-have for venturing into deep and steep areas. In powder, use a kick-step technique. Lift your foot and kick into the snow with the toe of your boot to create a step. The snowshoe will be angled to the slope with the tails hanging behind. This plants the snowshoe cleats/crampons into the snow directly under the balls of your feet. On crusty hard-packed snow you will rely more on the claws and your poles. Unless it’s very steep, simply walk up the slope. For steep inclines, flip up the heel lift of the snowshoe to put your leg in a more comfortable position for a long ascent. On descents, keep the poles planted in front of you and knees bent and relaxed. Your body weight should be slightly back. Plant heels first. Poles provide more balance and control on descents. While optional on flat terrain they come in handy on many outings. Not only do they provide support and give you better balance, they also give your upper body a workout along the way. Adjustable poles are best since they can be shortened for uphill travel and lengthened for descents. When you cross a slope, one can be extended for the downhill side and the other shortened for the uphill slope. Snowshoeing in the back-country comes with certain hazards to be aware of: creek crossings, changing weather, avalanche conditions, and tree and rock wells among others. It’s always your responsibility to be aware of your surroundings so you can safely enjoy your sport.